"The first respectable solo that I learned how to play note for note was Eruption"
Clint Lowery talks about his first guitar, his first big gig and he first solo he totally nailed. Atlanta-based metal kings Sevendust clearly aren't into sitting around for too long. Their ninth studio album, Black Out The Sun, is only a year old, and here they are with a fan-funded follow-up, Time Travelers & Bonfires, due out April 15. Taking a page from their 2004 Southside Double-Wide: Acoustic Live LP, the five-piece band (guitarists Clint Lowery and John Connolly, singer Lajon Witherspoon, bassist Vincent Hornsby and drummer Morgan Rose) reconvened at Architekt Studios in Butler, N.J., where they recorded last year's set, and bathed a batch of originals and six fan-selected cuts from their catalog (Gone, Denial, Trust, Crucified, Karma and Black) in the sounds of acoustics. 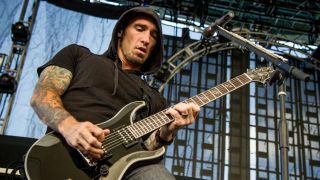 While prepping to hit the road with Sevendust, Clint Lowery sat down with MusicRadar for a little something we like to call Famous Firsts. Check out the exclusive studio footage of the band below. To order Sevendust's Time Travelers & Bonfires, visit iTunes and Amazon. "My first guitar was an Aria Pro II. I was probably 12 years old when I got it. I was a drummer first, and then I started playing acoustic guitar. The Aria Pro was the first electric I ever owned. It was a good guitar, good enough to get me going." "My mom and dad were in a band together called Plant & Sea. It was a '60s band, very influenced by Jimi Hendrix. It was kind of funky and of its era, a lot of vocal harmonies. My mom sang, so she added a Grace Slick element to the band. One of my earliest influences was probably the self-titled record they did back in the day. It was the first record I ever heard that made me want to play music myself." "I was probably messing around with some Journey songs, trying to learn some of Neal Schon's licks. But the first respectable solo that I learned how to play note for note was Eruption. Learning the full piece was definitely the ultimate dream, but there were a lot of things on the way to that, bits and pieces of things. Eruption was the Mt. Everest of the time. It took me months and months to get it down. "Randy Rhoads' solo to Over The Mountain might have been next. It took me a while to figure that one out, too, because I thought he was using a whammy bar and I found out he didn't." "Probably an Ibanez, one of their earlier ones. I don't know the actual model name, but I got a proper Ibanez after the Aria Pro II. It played great, sounded great. My first good amp was a Peavey Renown, your basic two-speaker combo amp. Where I came from, that was the pinnacle amp to get; everybody wanted the Renown. I also got a Marshall Lead 20 that I thought was great, but the Peavey was the first really good one." "That would have been my old band Sirius. Man, I should have trademarked the name - Sirius Satellite Radio could pay me royalties. [Laughs] I was looking through a dictionary, and I read that Sirius was the brightest star in the heavens, so I thought that was pretty cool. Sirius was me and my two buddies. We were a metal band, heavily influenced by Dio and Iron Maiden and Priest - that's what we were going for." "I wrote a song called Vander Lights when I was really young. I thought it was pretty great. It was based on this urban legend about this old guy who got his head cut off - he would hang around a railroad track. I thought it was an awesome song, if I do say so myself." "Probably a Paul Reed Smith Custom 22. From the second I first placed one, it encompassed everything I wanted in a guitar. It was stable, it stayed in tune, it played great, the design was cool - the whole thing was easy to fall in love with. I've been playing them ever since my first one." "After we played the show, I was like, 'Wow, that happened fast!' I was hooked. It's almost like a high you wanna keep chasing your whole career. You want more crowds, bigger crowds. Believe me, I had played plenty of shows to nobody, so being on stage in front of a lot of people, I was ready for that." "I met Eddie Van Halen and Dimebag, but I want to mention Steve Vai. Flexible was one of those records I used to listen to over and over and just try to learn the whole thing. He's such a big influence on me. I got to meet him, and I actually got to play on stage with him a little bit. It was incredible. Steve Vai is my favorite guitar player, by far. And he's super-nice, too - I couldn't believe it. One of those times when it was cool to meet your hero, you know?"